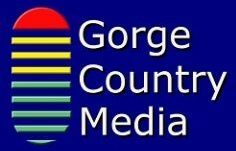 After doing more than 750 of these author interviews we thought we’d found just about every path taken to become an author, this guest has definitely taken the path less traveled. 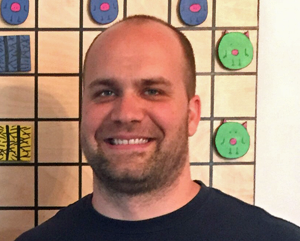 Brian Calhoun is a luthier by profession – a highly skilled maker of stringed instruments at his Rockridge Guitar Company. In his case, high-end acoustic guitars for customers such as Dave Matthews and Mary Chapin Carpenter. But one day he was playing a board game and found it boring. “I can do that,” he said, and did so. The game involves a fanciful character he invented called a chickapig – half chicken and half pig. It’s a charming whimsical animal and the game, involves getting your flock of chickapigs from one side of the board to the other maneuvering around obstacles and the efforts of others trying to do the same and block you. It is easy enough to learn but contains enough strategy that it’s been a MENSA select mind games winner and has been called the farmer’s chess. It was so intriguing that musician Dave Matthews has partnered with Mr Calhoun in production of this very professionally designed game. But that’s not all. 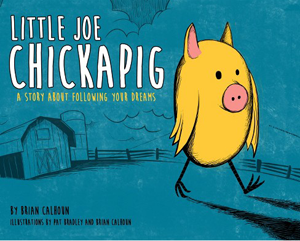 Mr Calhoun has also written a charming children’s picture book featuring a young chickapig in a story about hope, inspiration and following your dreams. Its readers enter a world where a young Chickapig wants to leave his farm, but doesn’t know how. Imaginations will soar as you read one courageous tale after another. Little Joe Chickapig has a message every parent wants their child to hear: Follow your dreams, whatever they may be.